Mike Tyson arrives at the "Kickboxer: Retaliation" premiere held at the ArcLight Hollywood in Los Angeles, Calif. on Wednesday, Jan. 17, 2018. That might not sound like the Mike Tyson we know and love, the “Iron Mike” with fists of fury whose origin story of hard knocks in Brooklyn, N.Y. – before its time of gentrification – made him a sensation. You could never imagine that the youngest boxer to win a heavyweight title at 20, and the first heavyweight boxer to simultaneously hold titles with the WBA, WBC and IBF, would ever back down from any battle. The first trailer for 'Creed II' is finally here. Can you spot all the Philly locations? 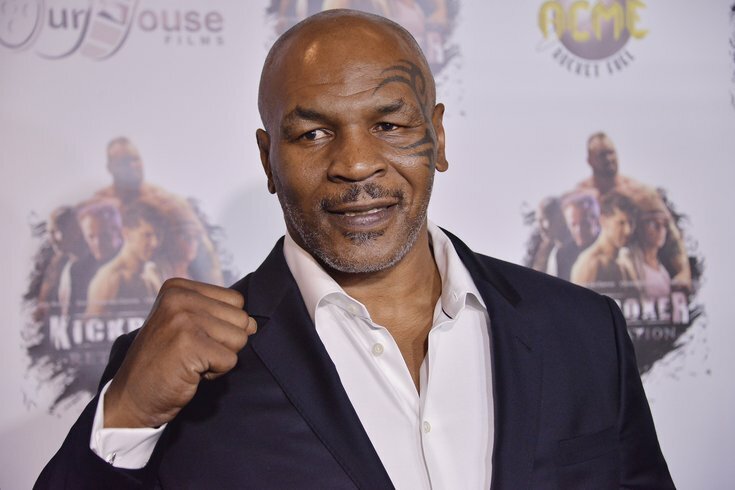 Yet, at nearly 52 years old (his birthday is June 30), Tyson has retired on top – after years of battling his own demons outside the ring – and grown into a groove that includes projects such as making movies, being an animated superhero, and most importantly, being a one-man-show, all of his own, with “Mike Tyson: Undisputed Truth, Round 2.” This theatrical presentation of his life immediately following his retirement in 2005 is being staged at the Borgata in Atlantic City, N.J. this Saturday, June 23. Joke with Tyson that this may be the very time in the ring of The Borgata without wearing boxing gloves, and he laughs at the thought. “Those days are over for me, man,” said Tyson, who weighs in these days at 245 lbs. Could he take the boxing world’s most up-and-coming menace – Errol Spence, Jr.? “He is really good, the one to watch," he said. “I really didn’t want to do [the show], but, luckily, Warner Bros. didn’t listen to me, and are smarter than me, because it has turned out really great and fun to do," he said. Having his own children as his biggest fans is a bonus for the champ, even though he claims that their reaction is very critical. Tyson’s children must be no fans of pop’s one-man-shows: “Mike Tyson: Undisputed Truth,” and “Mike Tyson: Undisputed Truth, Round 2.” Inspired by Chazz Palminteri’s one-man dramedy, “A Bronx Tale,” (not to be confused with the currently running Robert DeNiro-directed Broadway musical of the same name, which stems from a Palminteri book), Tyson tried his luck with an early version of his show on stage in his adopted hometown of Las Vegas, Nev.
Tyson’s hard luck story of growing up on the mean streets of New York – to say nothing of his battles with booze, drugs and women – quickly became the toast of the town. “I got less nervous after I did the show a couple of times,” he said. Tyson also got a fan and a partner in director Spike Lee, who brought the show to Broadway in August 2012, then to a 36-city, three-month national tour, then onto HBO in November 2013. The best part of play-acting as himself on stage as opposed to boxing? “I didn’t have to go to the hospital every night,” said Tyson. With “Mike Tyson: Undisputed Truth, Round 2,” the champ is doing something that his gut told him to do in round one – keep punching. Keep telling your story. Yes, there is drugs and depression, but there is redemption and romance too, as his wife plays a graceful part of the proceedings. Yes, it is difficult for a tough guy to tell such intimate and tender stories about himself. But for a guy who made battering down people his living for a long time, tender is his new default position.